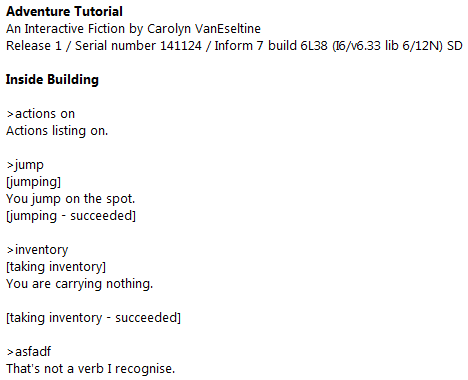 This is the fourth in a series of quick-start Inform 7 tutorials using examples from Colossal Cave Adventure. More information about this tutorial series can be found here: A Quick-Start Guide to Inform 7. It’s not Adventure without XYZZY, so this lesson will cover how to build the XYZZY command in Inform 7. 4) Teleporting the player only if the player knows about XYZZY. To start out, we need two rooms – In Debris Room, and Inside Building. See lesson 1 to review making rooms. 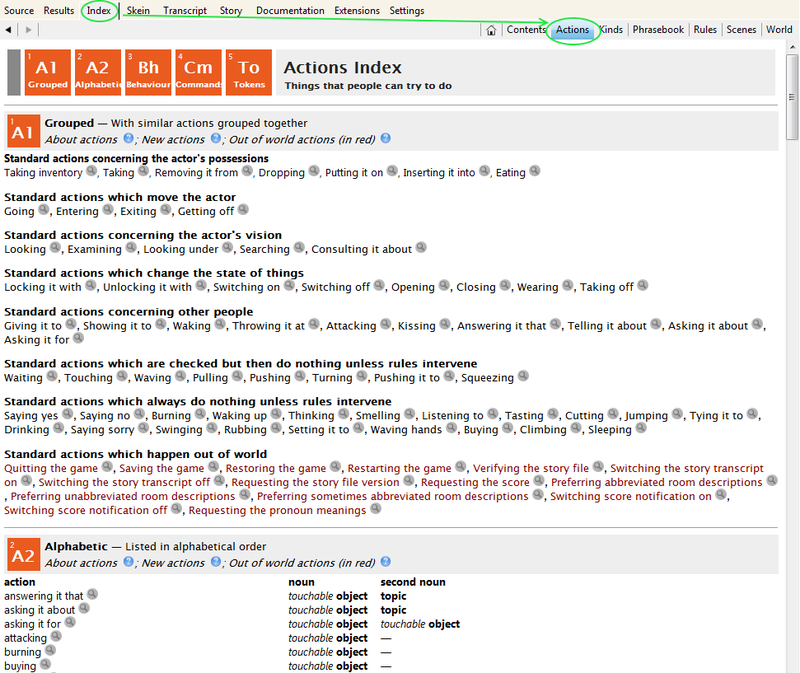 In Inform 7, the parser is responsible for converting player commands into actions. As you can see, there is no action listed after asfadf because the parser could not turn it into an action. Xyzzying is an action applying to nothing. Xyzzying is an action applying to nothing. <– This line creates the action. It could be called any number of things in the source code – xyzzy, saying-xyzzy, magic-wording, etc. – as long as it is consistent. Without this line, xyzzying has no meaning. Understand “xyzzy” as xyzzying. <– This line tells the parser how to recognize if the player wants to xyzzy. Typing “xyzzy” into the parser will now activate the code for xyzzying. Report xyzzying: say “You have xyzzied.” <– Action processing is broken into check, carry out, and report. The report section is responsible for printing text after an action has been carried out successfully. We can use ACTIONS again to verify that the new command is working, like so. Right now, the XYZZY command doesn’t do anything but print some text on the screen. That’s not so great for XYZZY, but most polished parser games do include informational commands such as HELP, ABOUT, CREDITS, and WALKTHROUGH for the player’s benefit. These commands can be created easily with the source code above. Helping the player is an action out of world. Understand “help” as helping the player. There is a room called Inside Building. 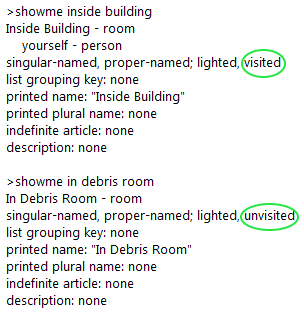 There is a room called In Debris Room. Carry out xyzzying: now the player is in In Debris Room. Adventure doesn’t say “You have xyzzied”, of course, but it’s a good opportunity to see the order of action processing. In order to send the player to the correct room, we need to check the player’s current location. This was covered briefly last time when we were looking at the changing description of the rough stone steps. Here’s the updated source code, taking the player’s location into account. Note that the separations above need to be tabs, not spaces. Failing to use tabs will stop your code from compiling. The begin/end syntax ignores whitespace entirely. You could write the whole thing on one line and it would still compile. 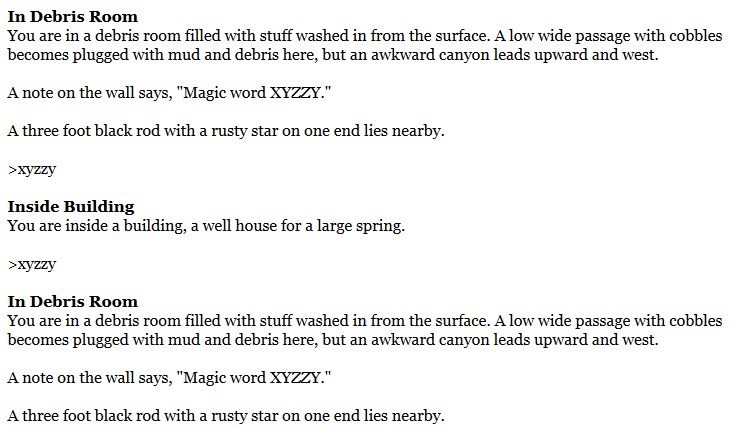 At the beginning of Adventure, typing XYZZY just produces “Nothing happens.”, even if you’re in Inside Building. There are a few ways to handle this, but the easiest is to look at the visited/unvisited property of In Debris Room. Thanks for showing the Inform index! It’s gotten incredibly useful in recent iterations especially for updating default library messages. I could not survive without it! Especially when working on something like Ollie Ollie Oxen Free, where the NPCs had to have sensible messaging for EVERY library command. Thank you for this, I was really scratching my head how to do doorless navigation.